Filmmakers, distributors and industry executives lead conversations examining the documentary world from artistic, business and financial perspectives and discuss how to succeed in today’s landscape. Filmmaker Dawn Porter (Bobby Kennedy For President) shares her thoughts on the current state of documentary filmmaking. Open to all badge holders on first-come basis. Amir Bar-Lev (Long Strange Trip), Lauren Greenfield (Generation Wealth), Shola Lynch (Free Angela and All Political Prisoners), Marilyn Ness (Charm City) and Marina Zenovich (Robin Williams: Come Inside My Mind) go in depth to discuss ways to merge style and content seamlessly. Moderated by Glenn Kenny (RogerEbert.com). 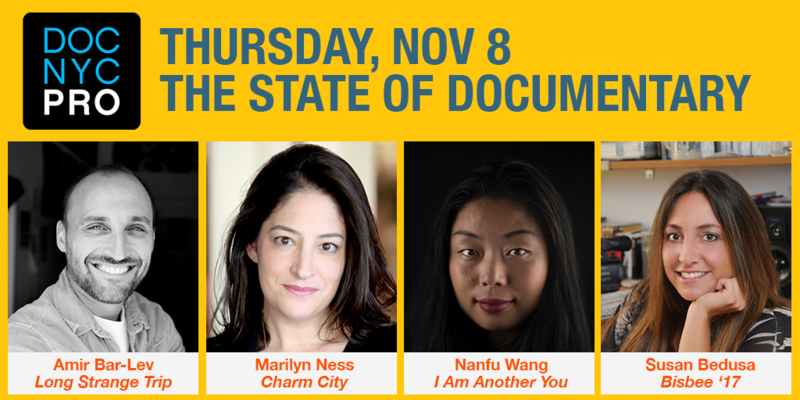 Nanfu Wang (I Am Another You), Tracy Droz Tragos (The Smartest Kids in the World), Vanessa Roth (Daughters of Destiny) and others explore the issues of complicated filmmaker/subject relationships and storytelling ownership. Moderated by Andrea Swift (New York Film Academy). What is the road map for funding a documentary? Maxyne Franklin (Doc Society), Tracie Holder (Grit), Erika Cohn (The Judge) and Eric Sloss (Cinetic Media) discuss the ins and outs of financing your film, analyzing specific examples from recent films and looking ahead to what’s on the horizon. Moderated by Christopher Allen (UnionDocs). Filmmakers Susan Bedusa (Bisbee ’17), Andrew Sherburne (Saving Brinton) and executive Susan Margolin (St. Marks Productions) discuss how to maximize your film’s reach. Moderated by Jessica Edwards (Design Canada).